Wild boar meat has been called the whale of the mountain by Japanese. 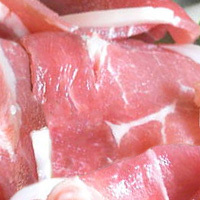 Traditionally, it has been eaten in hot pot dishes and stews. It is a good source of monounsaturated fats and zinc. It can be used to make ham in the same way the domesticated pigs. The calories in Wild Boar Meat per 100g(1cut ) is 268 calories. Wild Boar Meat is calculated to be 268Cal per 100 grams making 80Cal equivalent to 29.85g with 19.8g of mostly fat、18.8g of protein、0.5g of carbohydrates in 100g while being rich in vitamins and minerals such as Vitamin B12 and Niacin.